$3.99 For 1-Year Reader's Digest Magazine Subscription & Other Magazine Deals Today 3/2 | A Savings WOW! 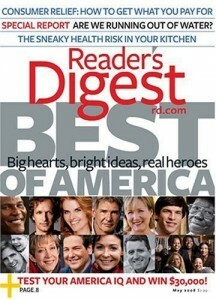 Today only, subscribe to Reader’s Digest Magazine for only $3.99 per year (73% off)! You can order up to 3 years at this price! Just enter coupon code SAVINGSWOW at checkout. This offer expires at Friday 03/02/12 11:59 PM EST. – Order Yoga Journal Magazine for only $5.29 per year (66% off)! You can order up to 3 years at this price! Just enter coupon code SAVINGSWOW at checkout. This offer expires at Friday 03/02/12 11:59 PM EST. – Order Tennis Magazine for only $2.99 per year (75% off)! You can order up to 4 years at this price! Just enter coupon code SAVINGSWOW at checkout. This offer expires at Friday 03/02/12 10:00 AM EST. – Order Redbook Magazine for only $9.56 per year (0% off)! You can order up to 5 years at this price! Just enter coupon code SAVINGSWOW at checkout. This offer expires at Sunday 03/04/12 11:59 PM EST. – Order EatingWell Magazine for only $11.16 per year (25% off)! You can order up to 4 years at this price! Just enter coupon code SAVINGSWOW at checkout. This offer expires at Sunday 03/04/12 11:59 PM EST. – Order Esquire Magazine for only $4.76 per year (40% off)! You can order up to 3 years at this price! Just enter coupon code SAVINGSWOW at checkout. This offer expires at Sunday 03/04/12 11:59 PM EST. Get your subscription to Teen Vogue Magazine for only $3.50 today!